THE search is on for the next Donegal Person of the Year to replace incumbent honouree, the top hotelier Deirdre McGlone of Harvey's Point. The Donegal Association has announced that the closing date for receipt of nominations is November 30, 2016. Any individual or any group may nominate a person – the main criteria being that the person nominated should have made a significant contribution to the promotion of the county at local, national, or international level. Nominations should set out the reasons for the nomination and include supporting documentation and endorsements from individuals and groups. 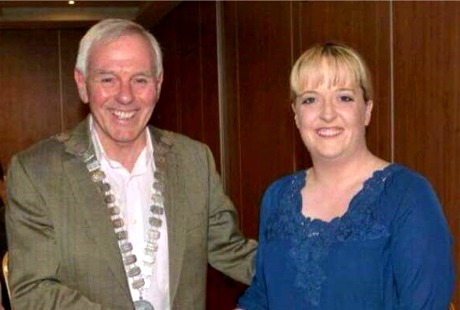 Donegal Association chairperson Elaine Caffrey and president Hugh Harkin pictured at the association's 2016 annual general meeting. Meanwhile, the Donegal Association has held its AGM at which Elaine Caffrey from Carrigart was re-elected chairperson. During her report, Ms Caffrey paid tribute to the late Charlie McGinley who passed away during the year. "Charlie served the association with pride and dedication over the years and he is greatly missed by the association," said a spokesperson. Creeslough native Hugh Harkin stays on as president of the Donegal Association with which he has been associated for many years. 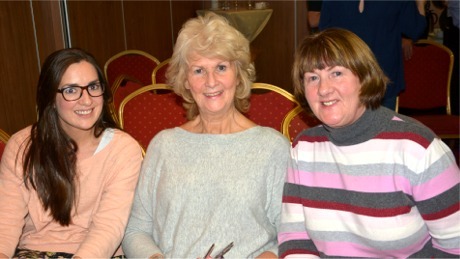 Pictured at the recent Donegal Association AGM are Aine Regan, Kathleen Sheerin and Marian Caffrey. Inishowen members on the committee include vice-chairperson Peter Coyle from Carndonagh and general committee member Peggy Stringer, also from Carndonagh. Nomination forms for Donegal Person of the Year can be downloaded from the www.donegalassociation.ie or by request from The Secretary, Donegal Association, c/o Teachers Club, 36 Parnell Square, Dublin 1.